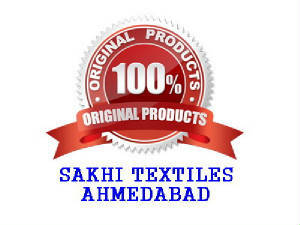 We, Unit of SAKHI TEXTILES are Manufacturer, leading wholesale supplier and Exporters of Unstiched Dress materials and Kurtis such as Designer Dresses, Bandhej Dresses, Silk Dresses, Batik Dresses, Printed Cotton Dresses, Cotton work Dresses, Lizy Bizy Dresses, Mull fabric Dresses, Designer Kurtis, and all kinds of Dress materials. 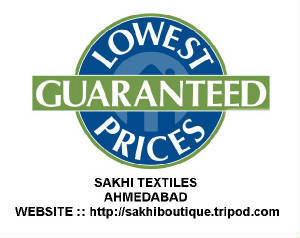 Impeccable quality of the Fabric, alluring designs and LOWEST price with customer satisfaction is our main Motto. We supply to Boutiques, Retail Shops, Wholesale Business, Home Business, Online Retail Business, Online Wholesale Suppliers with more than 1200 satisfied customers in India & around the Globe. WE SUPPLY ONLY FULL CATALOGS IN WHOLESALE AND NO SINGLES.. Being in this business since 2001 and with more than 1200 satisfied customer data base in India and around the Globe, We make the best of the quality with assured satisfaction for all our products. Our main strenght is the most competative rates and the unique collection of varity of ranges from best of the quality fabric which certainly adds a style to the statement to the archetypical female dressing.Our dress materials stand out for its fascinating styles from traditional wear to highly fashionable Designer wear. Our eye-catching dress materials are made from high quality fabrics with unique exotic designs that embellishes to your taste and style. Our range of dress materials manufactured are in varied colors and embroidery. These are offered with intricate patterns like exclusive unique designer work and traditional designs like bandhej, gamthi, chunnri print and many more to choose from. Our alluring dress material can be stitched as per the requirement of the end user available under one roof. Our dresses are designed with the unique hand and machine work by very well experienced workmanship with best of the designs in the fashion world and incorporate a unique blend of contrasting colors to make your outfits looks beautiful and gorgeous. 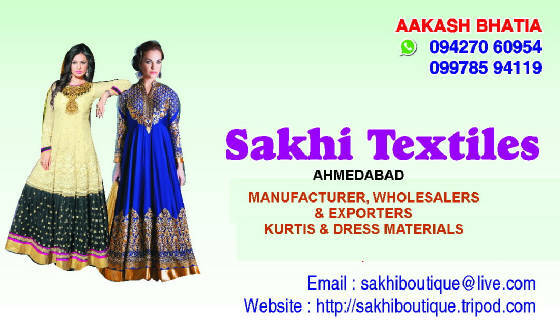 Disclaimer: All rights reserved to SAKHI BOUTIQUE © AHMEDABAD. Any unauthorized disclosure, copying, distribution of any contains or photos of this website is strictly prohibited, and if done, will result in strict legal action.